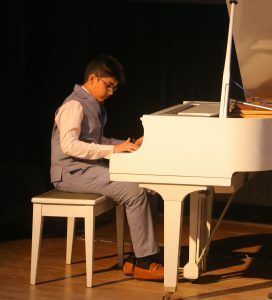 Sounak Malhotra, a 10-year old pianist under tutelage of noted pianist Ankita Kumar on October 10 left a deep impression on all those who had gathered at Delhi’s French cultural centre, Alliance Française de Delhi for a musical evening titled, ‘I Have a Dream’. Among the music lovers was a special admirer, Justice Dipak Mishra, former CJI of India. Organized by Colors of Music– a school of music welcoming students of all ages to train in the piano, the specially curated evening witnessed some quintessential western and Indian musical routines by Sounak. The young pianist has been performing since he was four years old. The child performer has performed in London previously. Colors of Music with its unique syllabus and one to one training methodology aims to provide every student an all rounded orientation and education of the piano. It aims to make learning the piano accessible to all aspirants from all walks of life.